Medical educational items, videos, web sites, blogs, news, and opinions. WE DO NOT GIVE MEDICAL ADVICE. ALWAYS CONSULT YOUR DOCTOR! REPEAT, THERE IS NO MEDICAL ADVICE HERE! This is a true story.Doctor: “What problem are you having?”Mother (pointing to her son): “He has a spider bite on his arm and it might be a brown recluse. "Doctor (examining the lesion): “Did you see a spider bite him? Mother: “Well, no, but some of his teammates have spider bites from spiders in the locker room." Two weeks later local newspaper headline – “FOOTBALL TEAM HAS STAPH INFECTIONS, Health Department Consulted. Consider this: A homeowner in Lenexa, Kansas collected 2,055 brown recluse spiders in his house, for six months in 2001, and had them verified as actual brown recluse spiders. NONE in the family of four members received bites from the spiders. If none of those living in a house with over 2,000 brown recluse spiders were bitten, how many brown recluse spider bites would occur in states and areas that are not know to have these spiders? You would expect to find thousands or even millions of brown recluse spiders in South Carolina, Florida and California to justify the many diagnoses of brown recluse spider bites in those states. 940 physicians in South Carolina, responding to a survey, reported 478 brown recluse spider bites in the state for 1990. 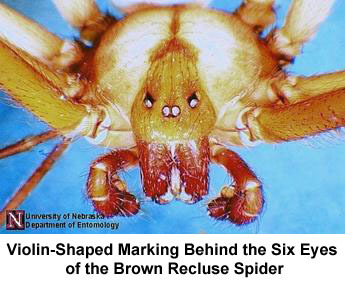 However, South Carolina is outside of the native range of the brown recluse spider and an arachnologist looked for brown recluse spiders intensively for five years in South Carolina and never found a brown recluse spider or had anyone bring him one. 21 counties in Florida had 95 brown recluse spider bite diagnoses in the year 2000. Florida's arachnologists report that no brown recluse spiders had been found in these 21 counties. 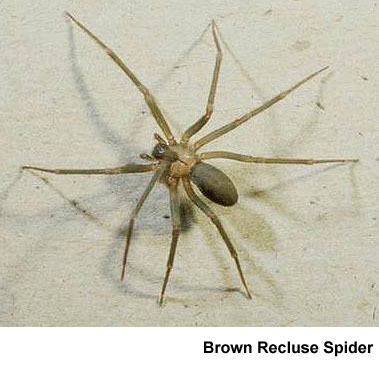 It is not uncommon for some in Kansas to find more brown recluse spiders in their house at one time than have been found in California in the last 40 years! Someone in Missouri has a good laugh every time a news report in California states that a brown recluse spider may have been found. It seems that those living outside the brown recluse spider’s habitat are dedicated to having the brown recluse spider live in their area! The spider is named “recluse” for a reason. It is shy and rarely bites. The spider’s web is not out in the open. To be bitten, you usually have to find the spider and be a threat as the spider does not go looking for you. That means putting on clothes that have been laying around which presses your skin against the spider, putting on shoes or gloves which the spider had gone into to be a recluse, rolling over on bed sheets and onto the spider, and picking up old boxes with your hands smashing the spider. Don’t get me wrong, rarely brown recluse spider bites can lead to serious problems and should not be ignored, but most households containing brown recluse spiders never have a bite. 90% of all brown recluse spider bites heal without scarring. Many brown recluse spider bites only cause a small red mark that resolves without problems. Loxosceles laeta (Chilean recluse), This spider is the largest of the recluse spiders found in the US and is strongly suspected of having the most "potent" venom. Things you can do to reduce the chances of being bitten by a brown recluse spider if you live in an area with brown recluse spiders.